When Is Cryotherapy/Ice Supported By Research? ~ Eat. Run. Rehabilitate. Howdy Readers! After yesterday's post ice seems to be a hot topic. I may have misled some of you yesterday with my thoughts on ice. Like many things in healthcare, science, and research the answers to questions are often shades of grey...not black and white like many would prefer. Therefore, today I wanted to share with all of you a guest post that I wrote for another website regarding a study that showcased a time when icing is warranted and was found to be very beneficial. This isn't the first article that shows evidence for this idea but it is the most recently published. Additionally, I wanted to hammer home the idea that ice can still be used to modulate pain...if a 14 year old high school athlete suffers a severe ankle sprain for the first time and is in a lot of pain it would be unethical and unreasonable to deny him a bag of "ice" because research shows that it may not change blood flow. I can still help to modulate his pain without the use of narcotics or NSAIDs (a whole different bag of worms). Nevertheless, pain should still be viewed as a perception and as something that can alter movement/motor control. We do not want to associate pain purely with structural damage because we know that is not the case based off the latest pain science. What I am against however is clinicians that ice to "treat" or "fix" injuries instead of using sound clinical reasoning, causative biomechanics, and taking pain science into consideration. We need to question the mechanism of why we are choosing a certain treatment, exercise, or modality. Enough with the ranting, here is my article! A Novel Approach for Treating Arthrogenic Muscle Inhibition in Post-ACLR Patients? Hart JM, Kuenze CM, Diduch DR and Ingersoll CD.J Athl Training. 49:6, 740-746. How many of you have had the struggle of dealing with an ACLR patient that has suffered from an inability to regain full volitional control of their quadriceps group? 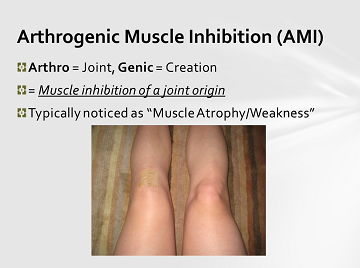 This is a known pathology called Arthrogenic Muscle Inhibition (AMI) which has been defined in the literature as an inhibitory reflex in response to damage that has been suffered by the joint structures of the knee and it affects the musculature surrounding the knee. It is currently theorized in this condition that efferent input to the quadriceps has been inhibited in response to “aberrant” afferent input from the joint and the amount of motor units available for volitional control has been decreased. Initially, AMI may work as a protective reflex loop to protect the joint structures from further damage. However, in the scenario of an athlete that has undergone arthroscopic surgery to reconstruct an ACL injury it can be a burden that prevents a return to pre-injury levels of strength and side-to-side asymmetries. This condition would definitely be considered a detriment when it prevents our patients from receiving the entire benefits from their rehabilitation program and may wreak havoc upon their gait and other movement patterns. What if this could be overcome with a simple and cost-effective intervention; perhaps an intervention as simple and globally available as applying an ice-bag prior to exercise intervention? Well that is exactly what this group of researchers did in this current study. Hart et al built upon previous research that showed that Hoffman reflex (h-reflex) could be increased when cryotherapy was used on subject’s with inhibited quadriceps due to knee-joints that had been artificially effused. There is lot to discuss when it comes to the intricacies of methods and procedures for this study and the SMR already had a great post recently going over those details. You can read their take in more depth right here. On a global and applicable scale you may be wondering what they found out. Well let me cut to the chase; using a cryotherapy intervention immediately before performing rehabilitation exercises resulted in better quadriceps function and strength gains compared to the other interventions. This study was another brick laid for this theoretical foundation and it is forming quite nicely. However, there is still more research to do on this topic such as investigating other knee injuries like PFPS, patellar tendinopathy, meniscal injuries, and longer intervention trials >2 weeks are definitely warranted. This study should be kept in mind that sometimes cryotherapy is warranted. Especially at a time when so many love to blindly point fingers at “passive modalities” such as cryotherapy. Anything can be the perfect intervention if applied in the right place, at the right time, and especially if it is guided by the right evidence. This is something to keep in mind the next time you find yourself struggling with a patient/athlete who is struggling to regain quadriceps function. It can’t hurt to try (unless they have a cold allergy), uses something that is most likely already located in your athletic training clinic, and has some promising research in the works.